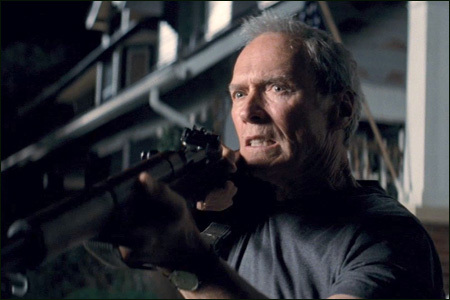 The trailer for Clint Eastwood's Gran Torino hit the web today. We first heard about this project earlier in the year when they were casting for the movie, and it looks like it's actually shaped up to be a halfway decent movie. Here's a recent USA Today article previewing the movie: First look: Eastwood puts his scowl in high gear for 'Gran Torino'. Walt Kowalski is a widower, grumpy, tough-minded, borderline-hateful, unhappy old man who can't get along with either his kids or his neighbors, a Korean War veteran whose prize possession is a 1973 Gran Torino he keeps in cherry condition. When his neighbor Tao, a young Hmong teenager, tries to steal his Gran Torino, Kowalski sets out to reform the youth. Drawn against his will into the life of Tao's family, Kowalski is soon taking steps to protect them from the gangs that foul their neighborhood. Watch the trailer here. Like I said before, I'm generally a fan of Clint Eastwood's movies, but I'm just a little wary of the whole white-dude-saving-the-Asians thing. And based on the trailer, there seems to be a lot of that. But I'm all for interesting, three-dimensional Hmong American characterssomething you rarely see in Hollywood movies. I'll admit I'm intrigued, and I'm willing to give Eastwood, both as a director and an actor, the benefit of the doubt. He is, after all, the guy had the guts to make a really interesting, complex and sympathetic movies about the Battle for Iwo Jima... from both the American and Japanese perspectives. And dude, is it just me, or does Clint Eastwood look more badass than ever at age 78?